When everyone has a place at the table in education, what are the possibilities? When our educational systems are NOT inclusive, how do we change them? 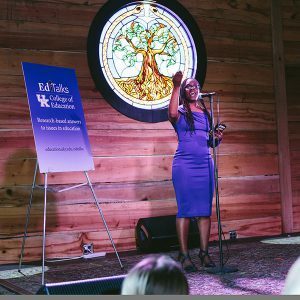 EdTalks was held at The Burl in Lexington. UK College of Education faculty members recently dove deeper into these questions, and more, when they provided free community talks during a casual evening at The Burl in Lexington. The eight short talks, “When Everyone Has a Place: Understanding Equity in Education,” explored issues surrounding equity in education, such as social inequality, health, racism, deeper learning models, broadening STEM learning, strengthening research and practice, and inclusive education. Candice Hargons, Assistant Professor, Department of Educational, School, and Counseling Psychology: Does Racism Break Hearts? Joseph Ferrare, Assistant Professor, Department of Educational Policy Studies and Evaluation: Social Inequality in Education: How Did We Get Here and What Can Be Done? See last year’s EdTalks here.